Traffic in California's Bay Area has increased by 25 per cent since 2000, increasing the average commute time with 10 per cent in the same period and making it the third most congested metropolitan area in the US. Finding digital solutions to reduce the traffic congestion was the goal of EIT Digital's DeepHack that took place 14-16 December 2018 at the facilities of Prospect Silicon Valley in San Jose. Thirty highly-skilled software developers, students and entrepreneurs worked 48 hours with the motto "Hack the Bay Area Traffic Congestion". EIT Digital and Climate-KIC, together with hackathon experts Ultrahack and partners City of Palo Alto and the Metropolitan Transportation Commission, challenged the hackers to find solutions that could help reduce the Bay Area traffic congestion, could be readily implemented and could be easily scaled. 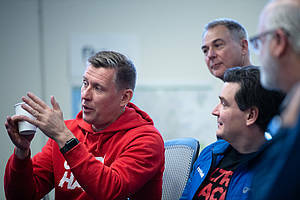 During the hackathon, the teams had between Friday afternoon and Sunday afternoon to make their concepts concrete by developing a solution that addressed the congestion issue. Teams from all corners of the world generated a wide array of interpretations and solutions. “Ultimately, solutions (to the traffic congestion problem) are going to come from surprising places, and we will have to find ways to bring in these points of view,” said Jonathan Reichental, Chief Information Officer of the City of Palo Alto. Teams featured a variety of backgrounds and skills, including planners, architects, software engineers and lawyers. Two teams were all-student contingents from Northeastern University Silicon Valley and University of California, Berkeley. “It is exciting to be here and see all the different solutions brought together to solve the Bay Area traffic congestion problem,” said Krute Singa, Principal Regional Planner at the Metropolitan Transportation Commission. In the end, three winning teams split $9,000 in prize money, while a fourth received both an Honorable Mention and a $1,000 peer-recognition prize. The 1st prize winner, team “Footbus”, offered a solution to reduce the congestion created by student drop-off traffic at school. Replacing a single choke point at the school with several drop-off points around the school offers a simple but powerful concept to diffuse traffic. Students can go the last mile with volunteer-supervised walking groups (“Foot Bus”) and are encouraged to gain badges via a special app that keeps track of the students’ pedestrian achievements. 2nd prize winner, team “Time2Park”, proposed a solution to help reduce traffic created by drivers in search of parking spaces in cities and crowded events. The solution identifies the probability of finding a parking spot in certain areas around the targeted venue and can be easily integrated into existing navigation solutions. 3rd prize winner, team “Smart Commute”, leverages AI technology to guide traffic via different routes to find the optimum traffic flow, thereby reducing the overall average congestion. Using a reward-based system, the app helps reduce the commuter’s wait time by modeling the best path to his/her destination based on the timing of traffic lights. Honorable Mention and Cooperation prize winner: The team “Lease Fractionalization” promotes traffic reduction by matching professionals with rooms, apartments or homes that can be leased on a recurring basis during the workweek. They also won the prize for the team that was voted as most cooperative and supportive of other teams throughout the weekend. The DeepHack in Silicon Valley was the second in a series of events that will take place all over Europe and in the Silicon Valley. As open innovation events, DeepHacks give business teams immersive access to the brightest and most creative next-generation digital innovators and entrepreneurs to solve their most critical business challenges and to create new business solutions. If you are interested in learning more about opportunities to participate as an industry partner, please contact iep@eitdigital.eu.